Robin Knox-Johnston whilst completing the first non-stop single handed circumnavigation of the world with “Suhaili“ – 16 December 1968; ~ a story that continues to be topical. Robin wrote me : “I leapt into the rigging to avoid being swept away, for a brief inglorious moment there was me & two masts in sight & nothing but ocean in any direction for 2,000 miles “. 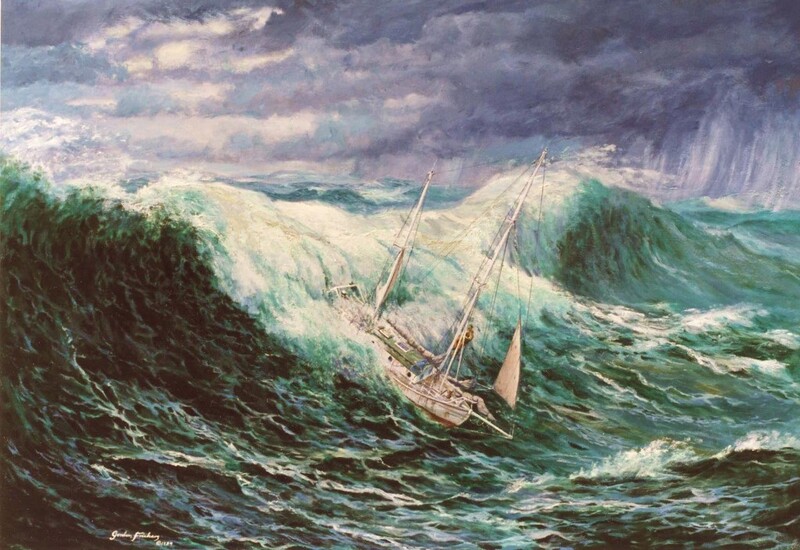 “Roaring Forties”, the original, measures 76 x 121 cm (30″ x 48″), oils on canvas, commissioned by Sir Robin Knox-Johnston and his wife Sue for his 50th birthday. Marine Art by Gordon Frickers. 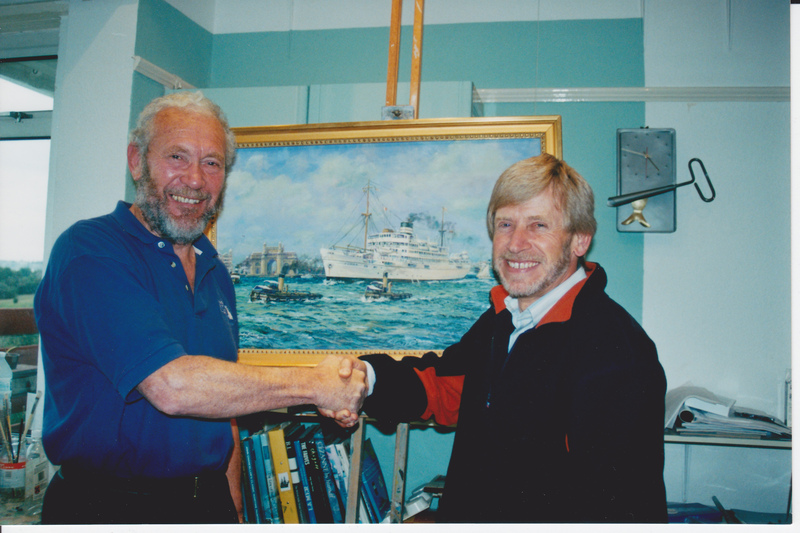 “Our efforts with the painting were highly successful”~ Sir Robin Knox-Johnston. Available on canvas for the look and feel of the real thing, a signed limited edition print from £157 inc postage. This is a painting or print which will hang comfortably with the finest marine collections. 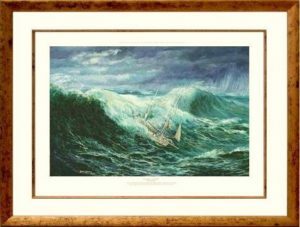 “Roaring Forties” and the signed ‘Heritage’ prints for collectors was specially commissioned by Robin and Sue Knox-Johnston for his 50th birthday. Robin and Suzanne were childhood sweethearts, were divorced before he left on the Golden Globe in 1968. They romantically remarried after he returned. For long weeks Robin ‘disappeared’, all contact was lost. Obituaries were prepared … then he spoke with a British Tanker in the Atlantic; he was nearing home. His very readable, absorbing story can be found in his book, “A World of My Own“. This painting has become famous, attracting world wide publicity in journals as varied as The Times (of London), Lloyds List International to Reader’s Digest and continues to do so. Winning or losing do not seem the crux’s of the matter as you listen to one of yachting’s seminal figures explain his motives. Age 26 at the time of the voyage, more recently aged 79, Robin said, “I hope this shows people sailing is a sport you can do from cradle to grave, and I’m not intending to rush to my grave,” he said from his yacht. 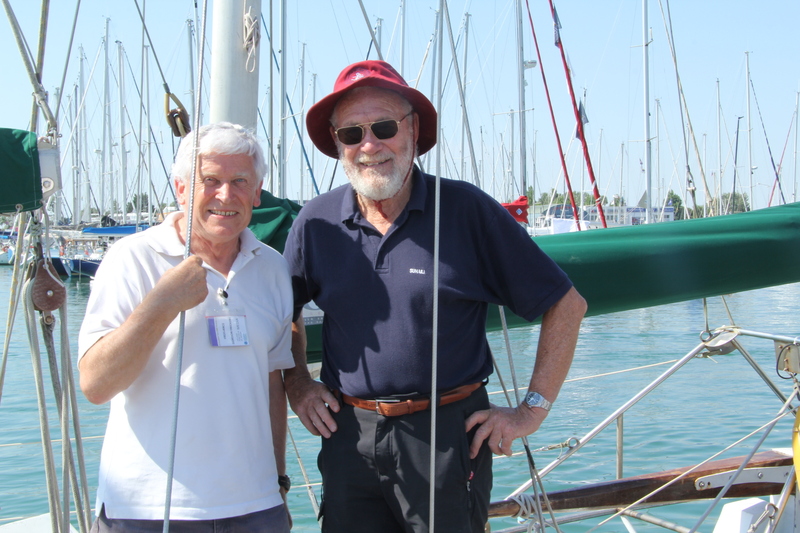 Sir Robin Knox-Johnston & Gordon Frickers, June 2018, at Sables de l’Olonne, France. 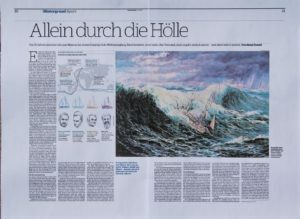 In Robin Knox-Johnston’s letter to me, he asked if the scene, impossible to photograph he wrote, might make a painting? Robin wrote, “I was working on the fore deck. As this huge Southern Ocean Greybeard approached, not the biggest but it looked dangerous, I leapt into the rigging to avoid being swept away. For a brief inglorious moment there was me and two masts in sight and nothing but ocean in any direction for 2,000 miles” = “ Suhaili “ on the 16 December 1968. 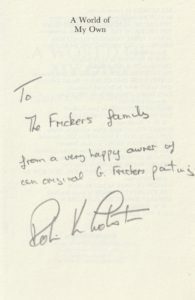 Later he wrote, “To the Frickers family, from a very happy owner of an original G. Frickers painting, Robin K Johnston“. Incidentally, Pete Goss MBE, Legion d’Honneur, another very distinguished sailor said one of the reasons he commissioned me to paint “Spirit of Mystery” was he so admired “Roaring Forties“. No one knows the great Southern Ocean better than Pete Goss. Tracy Edwards, also an MBE, who owns my notable painting “Ice Maiden” made similar remarks, she too considers her painting one of her greatest treasures. You can share in this. Our Limited Edition is supervised and signed by both Robin Knox-Johnston and me, Gordon Frickers, and comes complete with ‘THE’ splendid RKJ quote in the margin. You can order securely copies from our Print Gallery using Paypal or pay bank to bank using our Payment Page. 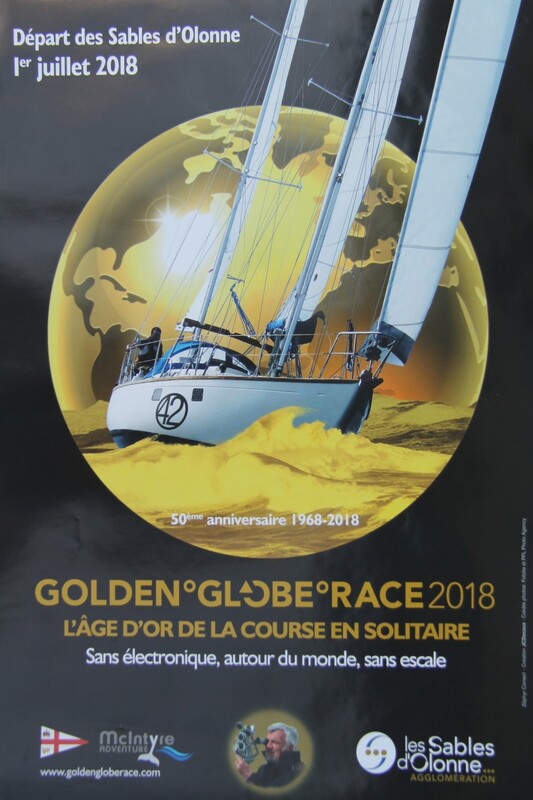 When Robin and I developed this painting in 1989 who could have guessed how quickly the sailing world would change with the introduction of the great circumnavigation races, Vendee Globe, Whitbread, Volvo, etc and much faster yachts? 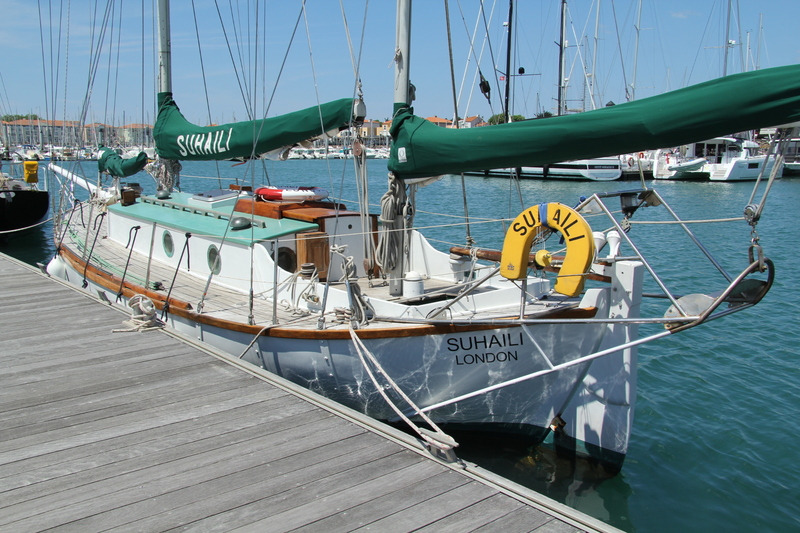 Robin Knox-Johnston’s voyage in Suhaili was truly historic; with a boat designed in 1923 which he built himself at Bombay and still to this day owns. Robin Knox-Johnston is the last of the circumnavigation pioneers, following in the wake of the racing wool clippers who’s numbers included “Cutty Sark” and Sir Francis Chichester. Just as there was only one Magellan (first to lead a circumnavigation of the world) , one Francis Drake (first Englishman to circumnavigate the world and first captain to survive the event), one Joshua Slocum (first single handed yachtsman to circumnavigate the world), so Robin Knox-Johnston and “Suhaili” were first to circumnavigate single handed nonstop and rightfully take their place on that exclusive historic list. This painting, created with Sir Robin, is part of the legacy of our times. Of the nine competitors who started the race in 1968, Robin Knox-Johnston was the only one who finished. One, Donald Crowhurst, committed suicide in the North Atlantic. It took Robin Knox-Johnston 313 days at sea and more of his life preparing to take the record in an adventure that changed his life. Robin Knox-Johnston was out of contact for nearly six months because of radio transmitter problems, so was also taken for dead. Robin Knox-Johnston eventually got a message to a British tanker with the help of a signal lamp and by then he was not far from Falmouth, the port where he had started. Robin Knox-Johnston has since sliced 200 + days off his 1969 time, his first circumnavigation reads very much as a passage from another time. 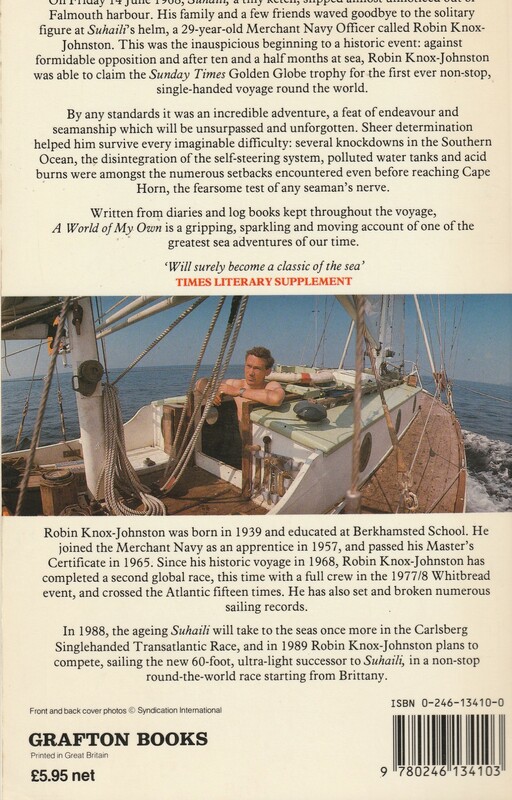 Back then, Robin Knox-Johnston packed dozens of cases of beer and dozens of novels. He dived off his yacht with a line tied to his waist for the occasional swim. He experienced the sort of isolation that today’s single-handed professionals, with their mandatory blogs, satellite phones and up-to-the-second weather reports, are no longer allowed, even should they wish to replicate. Robin and Suzanne were childhood sweethearts, were divorced before he left on the Golden Globe in 1968, then romantically remarried after he returned. 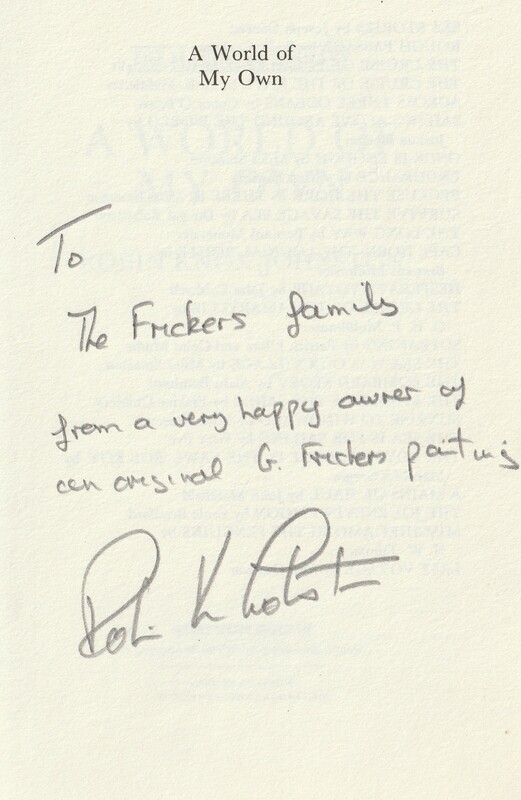 My copy of this book is inscribed, To the Frickers family, from a very happy owner of an original G. Frickers painting , Robin K Johnston. 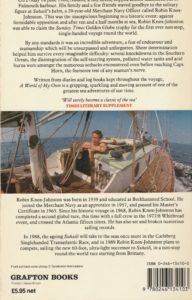 You might also read Peter Nichols’s 2001 book, “A Voyage for Madmen“, which recounts with considerable verve the Sunday Times Golden Globe Race in 1968 and 1969 that Knox-Johnston won by completing his circumnavigation. This classic painting is an inspiration to those who see life and tell the tale as it really is, to inspire people and endure long after we are gone. You can order copies from our Print Gallery using Paypal. 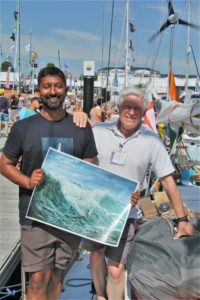 Whilst preparing for a single handed Trans Atlantic race, Knox-Johnston who had seen some unusual paintings of merchant ships, asked to meet the artist. Finding they spoke “the same language”, soon after he had an idea for Gordon Frickers. 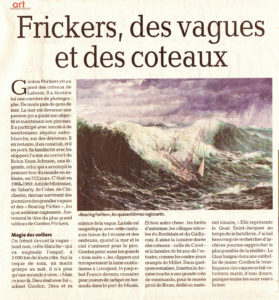 The two worked closely developing sketches based on Robin’s recollection, known wave shapes and Southern Ocean weather, the appearance of Suhaili etc drawing on their experience. 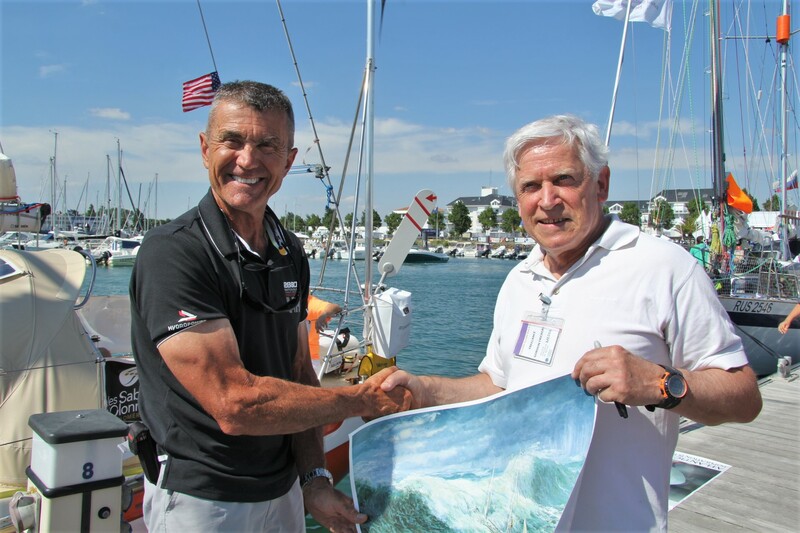 The result is a painting that hangs comfortably with the finest marine collections. Produced on a tactile cotton canvas using a 7 colour Ultrachrome process for faithful colour reproduction, guaranteed light fast under normal conditions in excess of 75 years. These pictures look and feel like the original, are a worthy addition to your collection. A2 is the standard print, the A1 large size is awesome, if you have the space, it’s well worth the difference. When I first saw the “Roaring Forties” I thought of the famous Japanese print “The Wave“. The horror of a small boat about to be engulfed by the vastness of a huge sea. The difference between “The Wave” is that we don’t know the ending because it’s in the artists mind. “Roaring Forties” however is real and Robin Knox-Johnston sailing “Suhaili” actually made it around the world and back to Falmouth. At the Golden Globe Race 2018, preparing to start, a typical comment to me on the penultimate day was from a skipper I met, Abilash Tommy of No 5, ‘Thuriya’, from India. Robin Knox-Johnston born 17th March 1939, in Putney, London is the eldest of 4 brothers. His career started at sea in the Merchant Navy with the British India Steam Navigation Company, which later merged with P & O. During that time he built his beloved ‘Suhali’ at Bombay. In 1962 he married Suzanne, (died 11.2003). One daughter, Sara, born in Bombay 1963, & 5 grandchildren. Robin Knox-Johnston has become a master mariner, very distinguished yachtsman and navigational specialist with a particular interest in ancient methods of navigation. He is very active in many areas of the marine world, has been a director of the National Maritime Museum, Greenwich, London and is a Knight of the realm. He built Suhaili while a cadet with B.I. in India, has had many other adventures with her and still owns her. 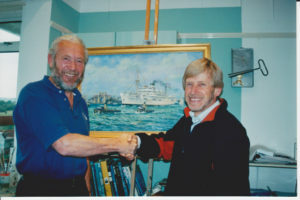 Painting of “Dumra“, Robin Knox-Johnston’s first ship. She is one of the most famous boats in the story of sailing and still raced today and yet has been refused a rightful place on the British Historic Ships list, considered to small. To our shame, if she was French she’d be on their list… Wake up Britons ! Gordon Frickers studied fine art at Maidstone and then Medway Colleges of Art, now part of Kent University, full time for 5 years. I am the only artist, painter, member of British Marine. My career started in central London, as a qualified photographer, an assistant, specialising in advertising, fashion and the press. Over many years I built on my experiences including at the Painting School of Montmiral, in SW France. My aim is for the originals to invariably have a high ‘WoW!’ factor, be widely recognised as distinctive, powerful, meticulously detailed, subtle, poetic yet unsentimental; sea paintings for sea men and women. 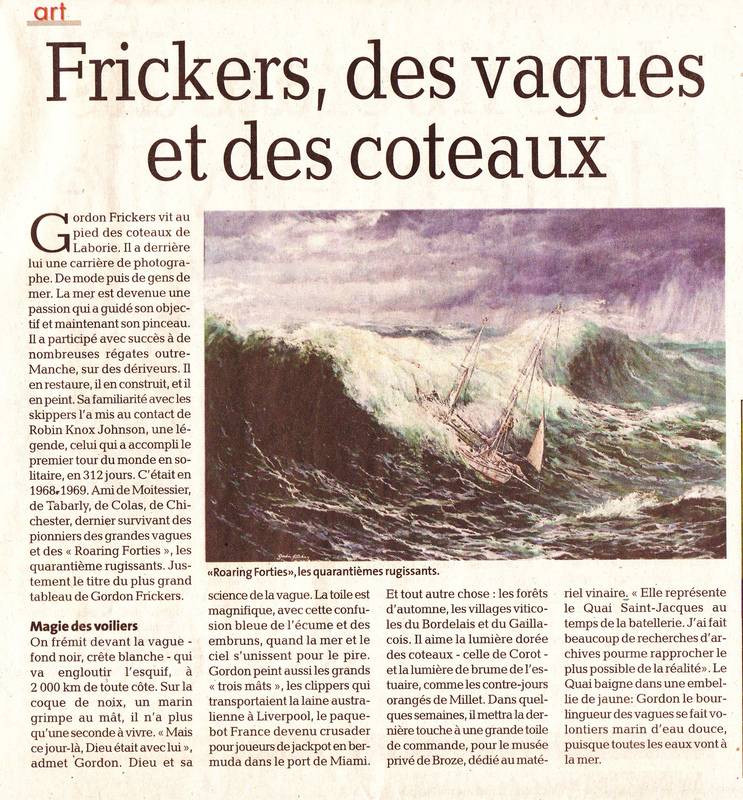 There is a list described by Audrey Hicks of Gallerie Marin, as “formidable” of distinguished individuals and famous companies who own examples of my work. It is true to write I am the only marine artist to have been ‘Official Artist’ to HMS Victory, to have been invited to make a one man show at the exhibited at the European Parliament (May 2011). I am listed in Debretts, Who’s Who, Wikipedia and can be found on the Internet. 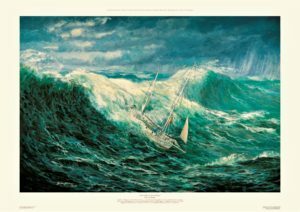 Order “Roaring Forties” now from our Print Gallery or regret at leisure! 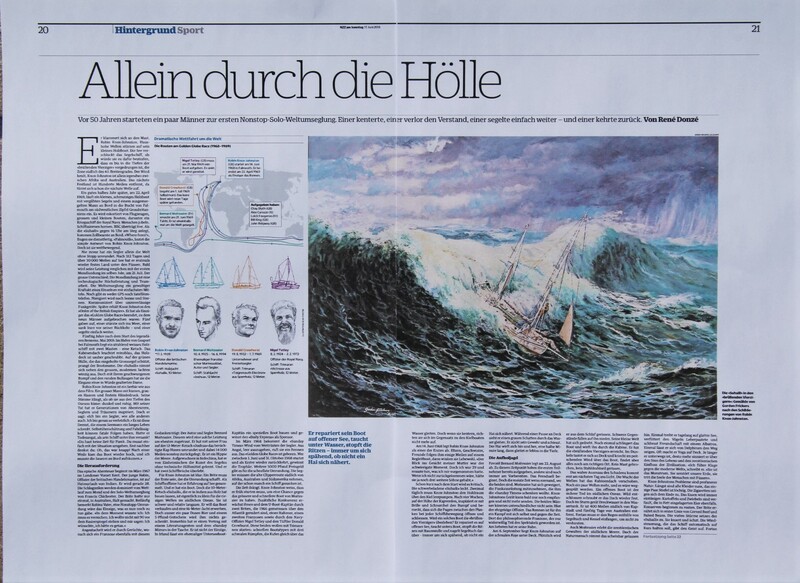 “for a brief inglorious moment there was me & two masts in sight & nothing but ocean in any direction for 2,000 miles “. The standard looks great, the large is awesome. Unframed as standard size £ 157., large size £237. Your price will included traceable, registered, insured postage. “Suhaili” is built of teak. Designed by William Atkins as “Eric” in 1923, her design is based on the Norwegian sailing lifeboat designs of Colin Archer. Official Number 306242 of London. “Suhaili” still belongs to RKJ and is now berthed, afloat, on the pontoon of the new National Maritime Museum-Cornwall, in Falmouth, and she is still loved, still sailed. Is any good fine art collection complete without a copy of “Roaring Forties”?